D4Science.org is an organisation offering a Data Infrastructure service and a number (+100) of Virtual Research Environments (VREs). To serve the biological, ecological, environmental, social mining, culture heritage, and statistical communities world-wide; VREs connect +5,500 scientists in +50 countries. To that end, D4Science Data Infrastructure integrates +50 heterogeneous data providers, and + 500 software components that execute +55,000 models & algorithms/month and provide access to over a billion quality records in repositories worldwide, with 99,8% service availability. 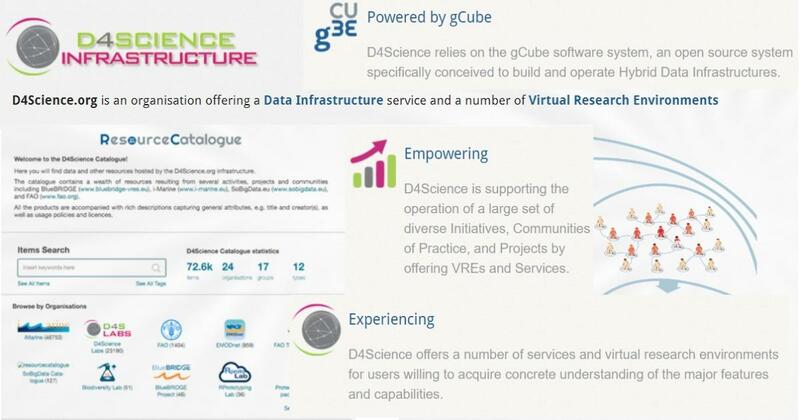 The D4Science infrastructure drastically reduces the cost of ownership, maintenance, and operation thanks to the exploitation of gCube and CKAN. >> Meet The D4Science Team. VREs are innovative, web-based, community-oriented, comprehensive, flexible, and secure working environments conceived to serve the needs of modern science. Regardless of geographical location, via VREs, researchers are able to use their Web browsers to seamlessly access data, software, and process resources that are managed by diverse systems in separate administration domains. Each VRE enables services and data exploitation to the users authorized to access the VRE. VREs' members have an individual account (SIGN IN D4Science) that allow them to save, edit, search and export their own bibliographic records. >> You can EXPLORE all D4Science VREs by clicking HERE. >> Learn more about D4Science Infrustructure Capacity by clicking HERE. ... rich descriptions/metadata capturing general attributes, e.g. title and creator(s), as well as usage policies and licences. When any user uses a service to load content into a VRE, the user retains the irrevocable, exclusive, worldwide right and license to use, reproduce, modify, display, remix, re-distribute, create derivative works, and syndicate your content in any medium and through any service. Only where the user has specifically shared, or used a specialized service for sharing data, the data become part of a derivative work to be licensed under a schema selected by the owner. Each shared set of data is associated to a copyright license. A CC BY-SA license - if the dataset is obtained with a mash-up process from different sources (a true derivative product), any other license (not technically supported by D4Science.org) in case of unaltered product shared with other Users/VREs. In both cases the metadata must be filled (if not automatically compiled) and a preferred citation must be indicated. Every dataset should include in its metadata at least a preferred citation, a reference to the infrastructure source dataset and its generation date, and the date that data were accessed or retrieved from the Gateway or any of its services. If the dataset was a composition of multiple datasets with different citations, the owner of the dataset should have added that to the relevant metadata. >> You can SEARCH in Resource Catalogue for Items and/or BROWSE by Organisations, Groups and Types HERE. For more details about D4Science Infrastructure, please contact the D4Science Team.